Thanksgiving has come and gone (hope you all had a lovely Thanksgiving!) and I don't know about you, but we have been having a pretty mild late fall compared to other years. 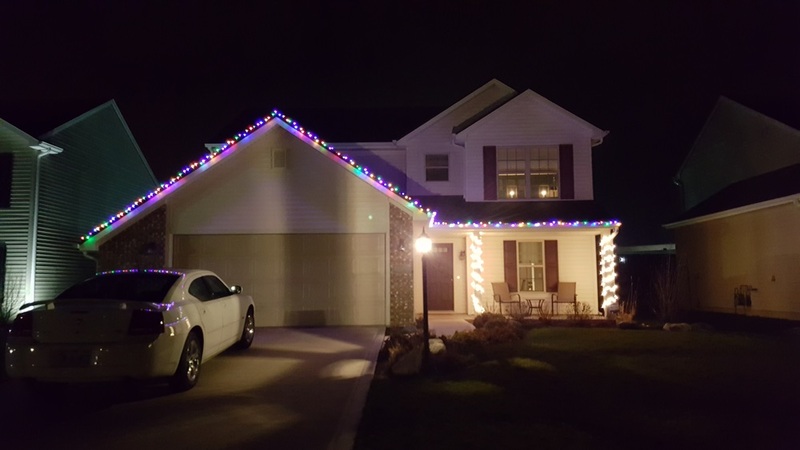 This is going to be our first Christmas in the new house so we were super excited to start decorating it for the holidays. I think we did a pretty good job, don't you think?? This is a pretty standard banana bread recipe and it's super easy. It's also nice that it doesn't require a lot of ingredients, I actually wasn't even planning on making it, but I had all the ingredients already and some over ripened bananas that I was probably just going to throw away, so I made some. Give this recipe a try and let me know what you think in the comments, it's definitely a winner in my book! Hello everybody! I trusted you all had a fantastic weekend. I just wanted to take this time and thank you for all your love and support. You are the reason why I keep blogging and hopefully I am supplying meaningful content that you enjoy reading...and tasting! For those of you that know me, probably know that pizza to me is like cocaine to a drug addict (to extreme? )....I love it. I'm always trying to perfect my pizza at home and I do a pretty good job at it (in my personal and wife's opinion). Of course pizza isn't always the healthiest food in the world....even though TECHNICALLY everything is healthy in moderation...well maybe not everything. But, the beauty about cooking is that everything can be made healthier, even if it's just a little bit. It took me about 4 attempts to get this whole wheat pizza dough where I like it. I was trying to find that perfect balance that supplied the health benefits of using whole wheat flour, but still had a tasty, soft/chewy/crunchy crust. Also, if you visit my blog on a regular basis (which you should!) you'll know that I try my best to make people a little more knowledgeable on food and cooking. So I figured I would take this time to talk about what is difference between whole wheat and all the other refined/processed flours. "According to the United States Food and Drug Administration (FDA), a whole grain is a grain that retains its basic form with key components intact after milling. You can call a grain product “whole grain” if at least 51% of its grains are whole. The grain’s structure and the balance between vitamins, minerals, and “phytochemicals” bring about the beneficial effects, while those same ingredients in their refined and enriched form, separated from the grain, do not have the same benefits. The label of 100% whole grain assures that a food contains a full serving or more of whole grain in each labeled serving, and that ALL the grain is whole grain. This is what you want to look for when you shop. Research shows that consuming true whole grains compared to consuming processed grains helps you live longer, makes you feel fuller for longer, and lowers your LDL (bad cholesterol), as well as decreasing the risk of diabetes by 30%." Combine flour, sugar, salt, and yeast in bowl of a stand mixer with paddle attachment. Set to stir setting and stir until dry ingredients are incorporated. Add olive oil and water. Run on stir setting, with paddle attachment, until dough comes together. Switch to dough hook and set to knead and let knead for 15 min. Remove dough from dough hook, form dough into a ball, and then place it back in mixing bowl. Cover losely with saran wrap and place in a warm environment. Let rise for at least an hour and up to 24 hours. If you are letting it proof for a long time, put in a ziplock bag in a fridge. If you are proofing in the fridge, remove from fridge 2 hours before use so it can come to room temperature. You could consider me a sorta pizza connoisseur...I absolutely love it and could quite honestly eat it every day probably haha. I have such a deep admiration for the art of pizza, I am always trying to make the best pizza I possibly can at home. Especially since ordering a pizza from a pizzeria is so dang expensive. By the time you order the pizza and if you get it delivered, you could end up paying 20 bucks for a pie! That just drives me nuts, because I know for a fact that it cost them probably $2 in food cost to make the pie. 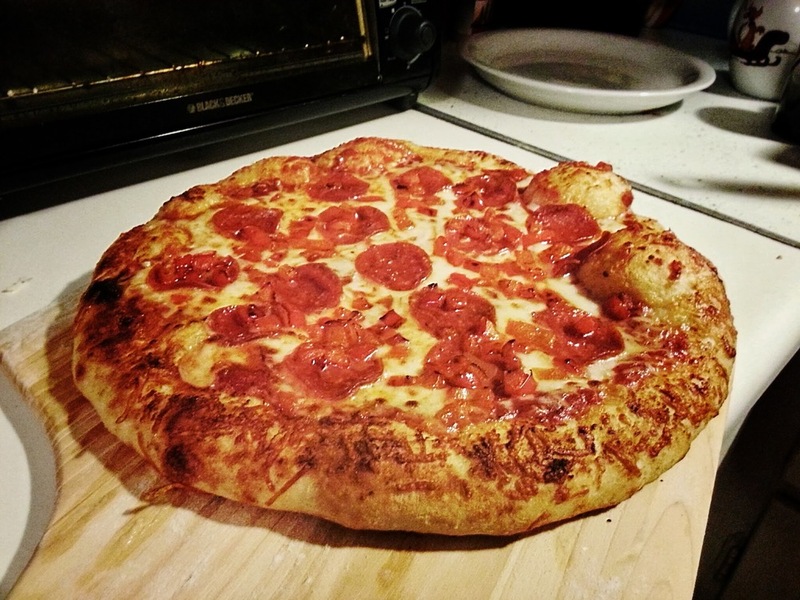 I have tried many pizza dough recipes, but I think I have finally rested on this one. It's just perfect in my book...the outside gets nice and crispy while the inside is light, airy, and moist. I also made a garlic-parmesan butter sauce that I brushed on the crust edge which gave it a really awesome flavor. MISE EN PLACE...MISE EN PLACE..MISE EN PLACE!!!! Like in all cooking, have your ingredients chopped, shredded, or what have you done and ready to go before you begin putting the pizza together. 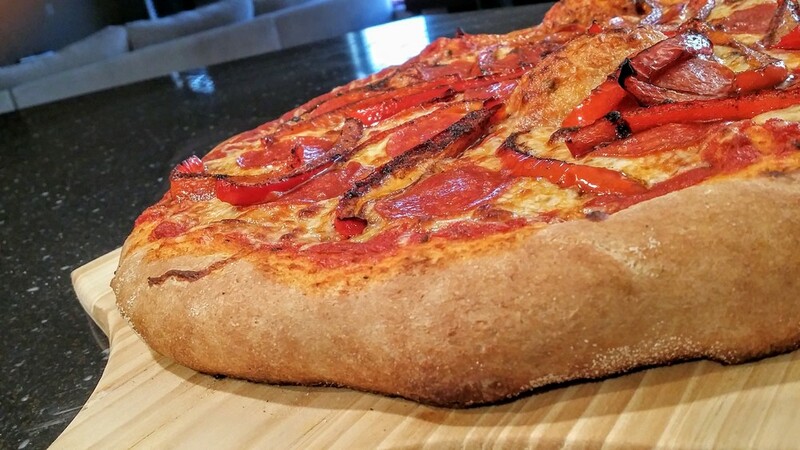 The longer the pizza dough sits on the peel the more likely your pizza is going to stick. You need to flour your peel with a light coating of flour. Sprinkle the top of it with a layer of flour, rub it in, and shake off any excess flour. 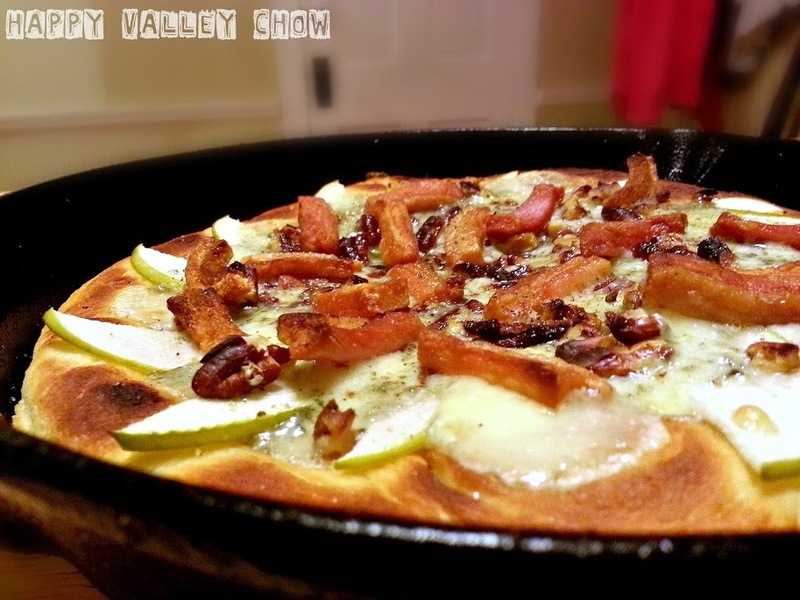 You don't want too much flour on the peel because it will burn when you slide the dough from the peel to the hot steel. This goes back to the Mise en Place, have all your ingredients ready to go and put your pizza together as fast as possible. Your Mise en Place should also include preheating your oven & Baking Steel. Because, again, the longer your pizza sits on the peel the more likely it is going to stick. Once you have your pizza dough formed into a circle on the peel, before you add any toppings (This part is crucial) give your dough a shake on the peel. Make sure it moves freely on the peel. Once you top your pizza it's time to slide it into the preheated oven ASAP. You need to slide the pizza with confidence and authority onto the Baking Steel. And you need to commit through the motion the whole way through. You need to own the pizza...I AM IN CONTROL AND YOU WILL SLIDE OFF THIS PIZZA PEEL INTO THE OVEN WITHOUT LOOKING LIKE PILE OF GOO!! There was one more, but I figured I would omit that one.